In small bowl, combine all ingredients except pork chops; mix well. Place pork chops in nonmetal dish or large resealable food storage plastic bag. Pour taco sauce mixture over pork chops; turn to coat. Cover dish or seal bag. Refrigerate at least 4 hours or overnight to marinate. Heat grill. When ready to grill, remove pork chops from marinade; reserve marinade. Place pork chops on gas grill over medium heat or on charcoal grill 4 to 6 inches from medium coals. Cook 11 to 13 minutes or until pork is no longer pink in center, turning once and brushing with reserved marinade. Discard any remaining marinade. To broil pork chops, place on broiler pan; broil 4 to 6 inches from heat using times above as a guide, turning once and brushing with reserved marinade. 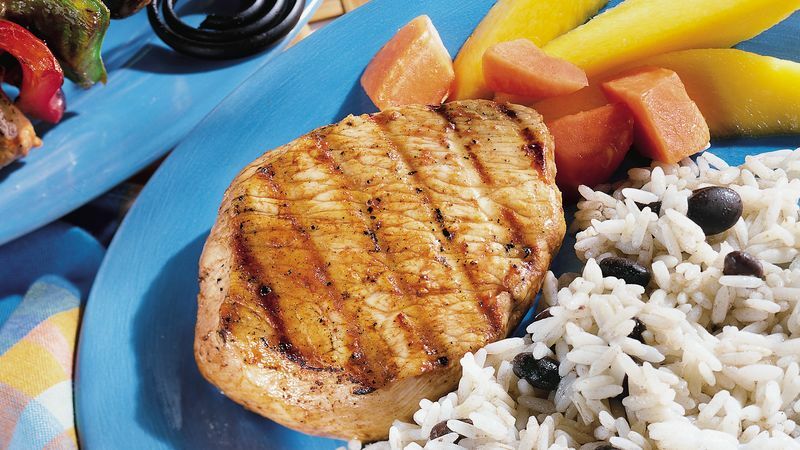 Cuban-style marinades often combine a citrus juice with rum. Distilled from fermented sugarcane juice, rum ranges from light-colored and mild-flavored to dark and deep. Cuban rum is dark, rich and full-flavored. Use dark rum to give these chops authentic flavor. Black beans and rice are perfect with this Caribbean-inspired recipe. Wedges of cool, fresh papaya and mango make a delicious dessert.